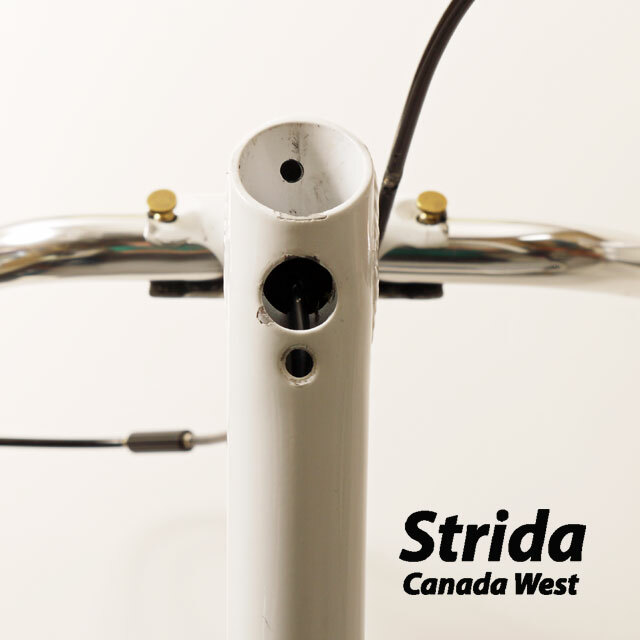 The Strida Ball Joint Socket is the top hinge point of the Strida bike. It is located at the top of the “A”, the point where the seat tube and the front tube join. 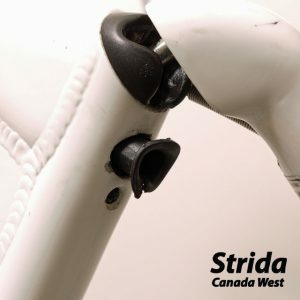 Strida owners may have noticed the warning on the bottom tube that demonstrates that the Strida Ball Joint Socket needs to be handled carefully. 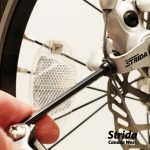 This warning is not there because of possible wear but rather the warning is there to warn Strida owners of the possible effects of miss handling the Strida Ball Joint Socket. 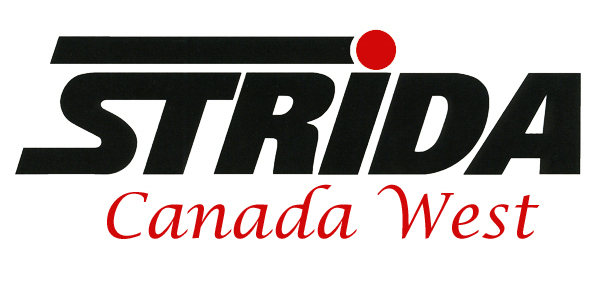 For myself when I am explaining the Strida to a person I describe the ball joint socket by comparing it to one’s own shoulder joint. 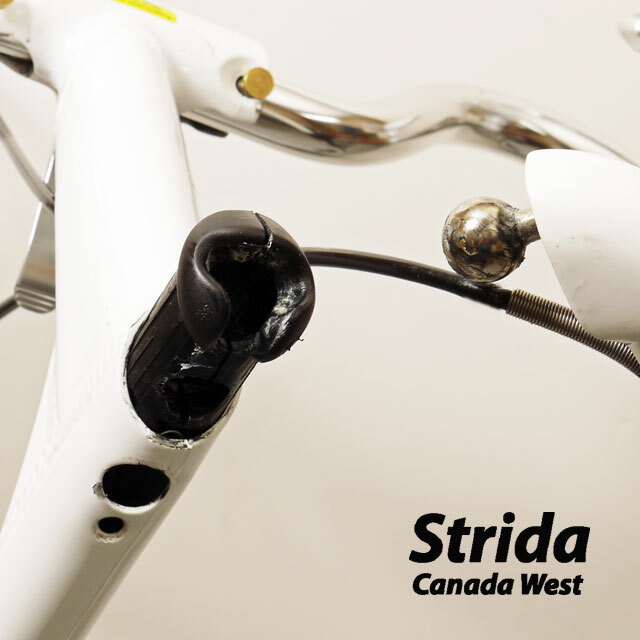 Miss handling the ball joint socket can lead to dislocating the Strida ball joint the same way a person can dislocate their shoulder. I think the Strida Ball Joint Socket is a brilliant design and one of the most important parts of the Strida bike. 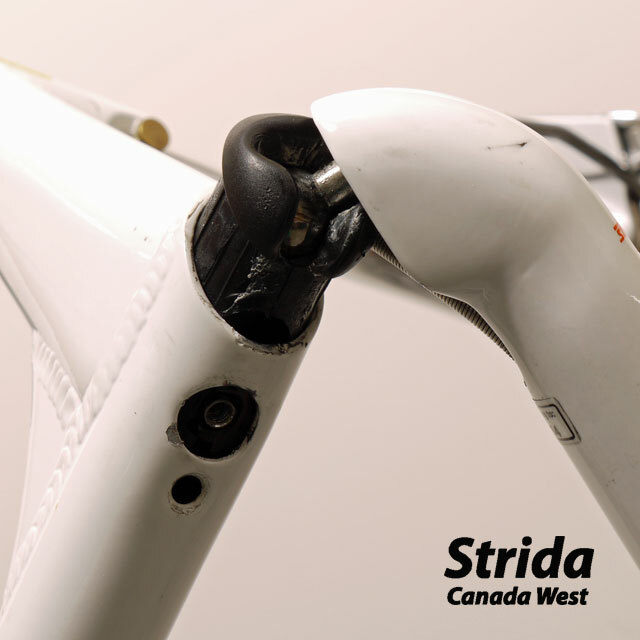 I don’t think you would find a similar ball joint on any other folding bike, but then no other folding bike folds like a Strida folds. 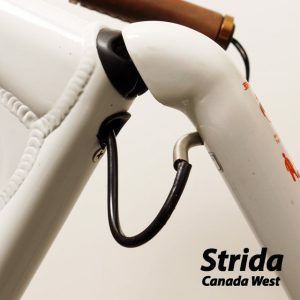 When introducing the Strida I make people aware that if you do not fold the Strida carefully or if you fail to completely lock the locking latch then the front tube can become over-extended. This applies unnatural force to the ball joint and like your shoulder it can pop out. 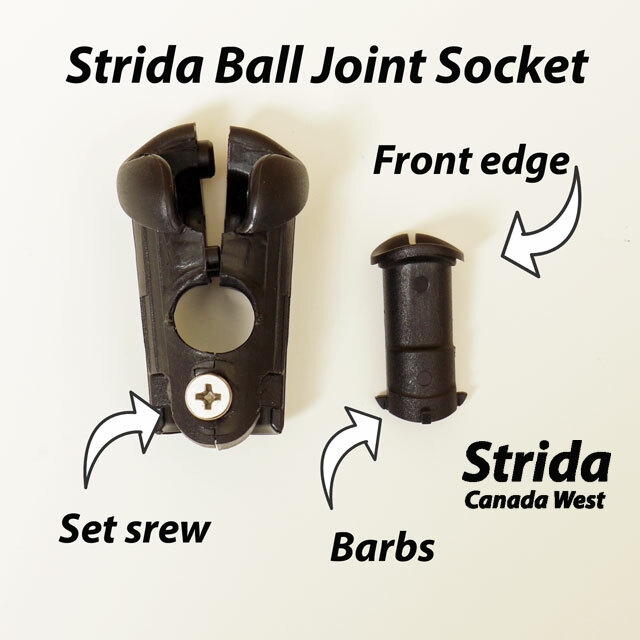 Most Strida owners will never have this problem and they will never need to replace their Strida’s ball joint, but if you do then here is how you can replace the Strida Ball Joint Socket. The parts of the Ball Joint Socket. The rear brake cable needs to be removed, loosen and cut the end of the rear brake cable at the rear brake caliper, then pull the cable out at the brake lever. When cutting the end off cut as little as possible. Update, thanks to my customer Johnny in Sweden he showed me how he was able to thread the brake cable end and the housing through the stem without cutting and removing the cable. You may first want to try skipping cutting the cable and removing the brake cable. The rear brake cable housing needs to be removed from the Strida stem and ball joint socket, pull the rear brake cable housing with the protective spring covering out of the stem at the top of the “A” of the Strida. Note, if you are only reinserting the ball in the joint and not replacing the complete ball joint socket you may be able to remove the metal screw, pry out the plastic part and lift the plastic socket far enough without removing the cable to reinsert the ball in the socket. 3. Remove the metal screw below the hole that the brake housing came out of, this screw holds the plastic part of the ball socket in the frame tube. 4. Pry the round plastic part out of the tube, this plastic part is the part the cable housing went through. It has small barbs on the end which hold it in place. It fits through the tube and into the other plastic part of the ball joint socket. Be careful not to scratch the paint on the tube, a thin flat screw driver will pry this part out. Applying some tape to the frame tube may protect it from scratching. 5. Pull the plastic socket and ball out of the top of the front tube, if your ball joint has become dislocated then you are only pulling out the plastic socket far enough to reinsert the ball in the socket. 6. Slip the ball joint socket with the metal ball in the socket into the front tube, the unit needs to be installed with the ball in the socket. The socket is lubricated with a white lithium grease. 7. Push the round plastic part into place, replace the metal screw, be careful not to cross thread it. 8. 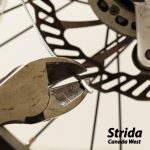 Replace the rear brake cable housing, this can be tricky, patience is important, catching the end of the housing at the hole under the stem with a thin screw driver can help to get it through the hole. 9. Thread the rear brake cable through the rear brake cable housing if you have a clean cut on the end of the cable this is easier, check that the cable housing is seated correctly in the brake lever and the brake caliper. 10. 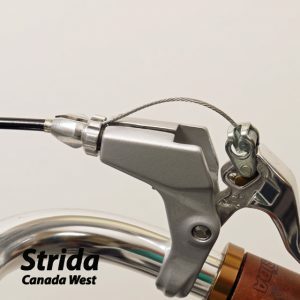 Adjust the rear brake caliper and brake pads this link will help with understanding and adjusting the brakes on your Strida. 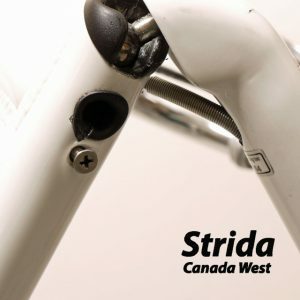 Crimp a end cap onto the end of the brake cable, I will include one with the Strida Ball Joint Socket kit. Brake cable end caps are also available at you local bike shop. 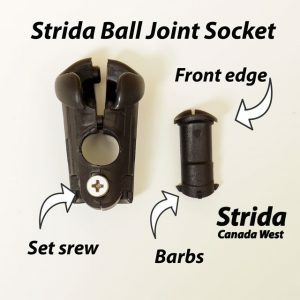 I hope this post will help to explain the Strida Ball Joint Socket and if you need to, help you replace it. There is a short cut if you find yourself with a dislocated ball joint socket in an emergency. 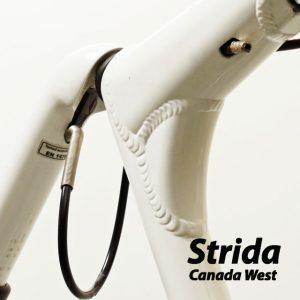 Turn the Strida upside down, perfectly on a soft surface like a carpet so that you don’t scratch the paint, align the ball with the socket, put your foot on the stem, and push the ball joint back together. Here is a link to a video that demonstrates. Most important, if your Strida’s ball joint has been dislocated then it has been weakened. You can put it back together but for safety sake it would be good to replace it. The ball joint is inexpensive and as you can see not hard to replace.